Moving to Manhattan may turn out to be the best decision you ever made, but it certainly isn’t for everyone. If the fast pace, excitement, and vibrant culture drew you in during a weekend visit, we’re here to tell you that living in amongst it is a dramatically different story. That’s not to say you can’t or shouldn’t do it, but you would need to be well prepared. Plan accordingly, and your move to the city will be every bit the thrilling adventure you signed up for. It’s not affordable to live in New York City. If this were true, there wouldn’t be 8.6 million people living there. You can absolutely find ways to stretch your dollars in the city. For starters, you can save big by not owning a car. Walk, bike, carpool, and rely on public transportation. When it comes to food, become a professional meal prepper, and keep an eye out for deals and publications about affordable places to eat and drink. There are also plenty of fun, free activities happening all the time — you just have to scout them out. It is crowded everywhere, all the time. While you might wait in some lines for coffee and rarely find yourself alone on a sidewalk in midtown, there are plenty of places to escape the hustle and bustle. Central Park sprawls across 843 acres, and it’s not the only park in Manhattan. Chances are, your neighborhood will have a cafe or restaurant only frequented by hyper-locals, and there’s always a museum, library, or meditation studio just around the corner. You’ll become an expert cab hailer. On those rare occasions that you do need a car instead of just walking or taking the subway, you likely won’t turn to the taxi system. Rideshare companies have taken over, and unlike many markets, Uber and Lyft aren’t your only options. Instead of aggressively waving and whistling at taxis, you’ll learn which trips and times of day are cheapest, using which app. Locals will run you over. Nobody in Manhattan walks down the street with their elbows out hoping to take out unsuspecting newbies or tourists. There is, however, strict sidewalk etiquette. Pay attention, walk at a decent pace, and stay single-file and you’ll have no problem. It’s not that the locals are out to get you, it’s just that the typical Manhattan lifestyle is faster-paced than … pretty much anywhere on the globe. You’ll probably get mugged. FBI data regularly puts New York City at the top of safest large cities in the country (those with more than 500,000 people). Just like anywhere else, if you use common sense and take some precautionary measures, there’s no cause to worry. Pickpockets and other thieves may create a diversion in an attempt to distract you. They can easily spot an enamored tourist marveling at the sights. Avoid walking alone late at night in quiet neighborhoods. Everything you already know about not being a target applies. You’ll be a Times Square regular. Unless you work nearby, you’ll only visit Times Square when your out-of-town friends and family members force you to take them. It’s crowded and loud in a much less charming way than the rest of Manhattan. Once you live in the city, you won’t have the time or the energy to deal with that touristy chaos. New York is only Manhattan. The city is actually made up of five boroughs: Manhattan, Brooklyn, Queens, the Bronx, and Staten Island. It also extends to New Jersey’s “Gold Coast,” including Hoboken and Jersey City which are just a train ride away. Each of these areas has its own culture and several hot spots worth checking out. It’s easy to get an awesome, high-paying job. It’s true that there are ample opportunities for success in Manhattan. There are a lot of high-paying jobs, and it’s a hub for a variety of start-ups. However, it takes a certain competitive edge to land them. You’ll have to work hard and stay aggressive to advance your career in this cut-throat market. You’ll spend a lot of time lost. Don’t let the image of a lost and scared person wandering around Manhattan alone worry you. The grid system makes it an extremely easy city to navigate. The island is made up of almost entirely right-angled streets named by their block number. And despite what you may have seen in the movies, you will be able to find someone to ask for directions without receiving a dirty look in return. You’ll never run into a celebrity. It has become fairly common to spot familiar faces around the city. Many celebrities live there, and others are around filming movies, playing concerts, or attending events at Madison Square Garden. If you’re out and about enough, you’ll have a celebrity sighting story to tell. You’ll get your nature fix at Central Park. While it’s gorgeous and huge, Central Park isn’t always enough to curb homesickness for those used to seeing green. For starters, it probably won’t be within walking range. You’ll have to commute to get there, and once you arrive, it’s still very apparent that you’re still in the center of a massive concrete jungle. You’ll still be able to hear honking horns and see some skyscrapers. Still, it is possible to lay out a blanket and get some much-needed space and time to relax. Everyone is rude. Most people in Manhattan would be happy to make small talk at the grocery store or give you directions — so long as it doesn’t slow them down when they’re running late. They can be short and pushy, but don’t take it personally. It’s often the only way to get things done in the city.Manhattan is also full of people who hail from abroad. It’s incredibly diverse, and people enjoy getting to know food and cultures that are different from their own. Love will find you. With more than 1.6 million people in Manhattan and more than 8.6 million in New York City, you may think finding love will be a breeze. Unlike most NYC-based movies, chances are low that your soulmate is going to save you from getting hit by a taxi when you trip in the middle of the street. Love may not find you, but that doesn’t mean you shouldn’t try to track it down on your own. Similar to landing your dream job, you have to go after the kind of relationship you want. It’s easy to get a date on the app of your choice, and you’re sure to meet a diverse range of people. Don’t be afraid to put yourself out there and meet some new people, even if it doesn’t work out the first time. You’ll never want to leave. Especially for non-locals, there will be times when you just need to get out of the city. If you love Manhattan and you want living there to last, it’s important to take some trips every once in a while. Remind yourself how to drive a car and head upstate, climb a mountain, or even spend a night in a house larger than 500 square feet. It will help you reset, and probably remind you how much you actually love the never-ending action that Manhattan has to offer. You should just figure it all out when you get there. 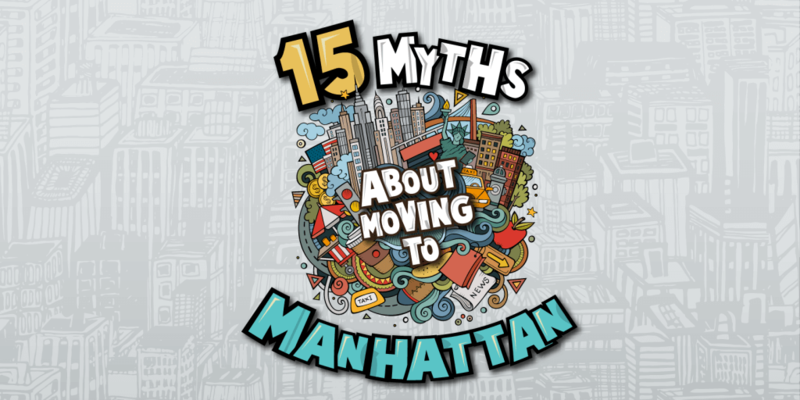 Fail to prepare for your move to Manhattan and realistically, you can expect to be moving right back to where you came from within the year. Life in Manhattan is truly unique. It’s fast-paced, expensive, and loud. Succeeding in the city will take some thorough planning and research. Before you pack up, talk to people who have done it, read about it, and visit Manhattan and the surrounding boroughs. If you are one who can quickly adapt to the hectic lifestyle, then there’s no more rewarding place to thrive on all that such a vibrant city has to offer. If you’re ready to move to Manhattan, the professional team at White Glove Moving & Storage can help you start your adventure off right. We’ve been moving clients in and around New York City for more than 25 years. We have the expertise to get all of your belongings into your new home quickly and safely. Contact us today for your free quote.